Is it possible [or will be] to slice beat in NS2? Since years ago, NS is my DAW. Already released several albums made 95% in NS, using the pc only for mastering. Not currently but it's definitely "on the list." For now, you can use something like the app Samplist and then import the zip of slices to Slate pads. You actually can chop a sample into individual pads in Slate, just doesn’t have that kind of interface. Use the Amp Hold and Decay settings to set the end of the hit, copy and paste to another pad, then on the Sample tab use the Offset knob to move the loop position, fine tune the end with Hold and Decay, repeat the process. I’m doing this now with my OP-1 drum sampler patches (they’re just single AIF files, OP-1 basically assigns loop markers to keys). very nice creative approach !! 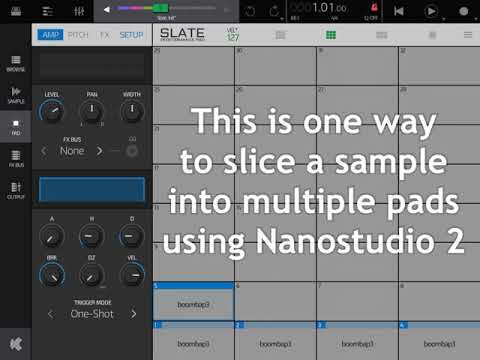 You actually can chop a sample into individual pads in Slate, just doesn’t have that kind of interface. Use the Amp Hold and Decay settings to set the end of the hit, copy and paste to another pad, then on the Setup tab use the Offset knob to move the loop position, fine tune the end with Hold and Decay, repeat the process. This is much easier than the ”duplicate and crop the sample” approach that I would have used, nice work! you should post this method, probably also with some recorded video to AB forums, i think it could be very helpful for LOT people who were asking for slicing feature !! I found it much easier just to crop and save. I have to say, the audio editor is a masterpiece. Once I figured out the workflow it was smooth sailing. That said, about 12 out of 24 slices in, I got bored and just sliced it up in BM3 with transient detection, saved out the slices to AudioShare, zipped and imported. Two minutes later my kit NS2 Kit was done. Yeah I’m going this route too. Pretty quick. Wondering if with the alternative internal workaround does ns2 internally duplicate sample in to ram for each pad? Or load/reference it only once to save resources? really like your method A LOT ! Did you use Samplist or ReSlice and can compare to the BM3 method? Good thoughts, but no, I figured this way was two kits for the effort of one, since I use both BM3 and NS2. Samplist doesn’t have transient detection, so probably wouldn’t be a big timesaver. I might try ReSlice though out of curiosity. If I do I’ll post over on the other thread. 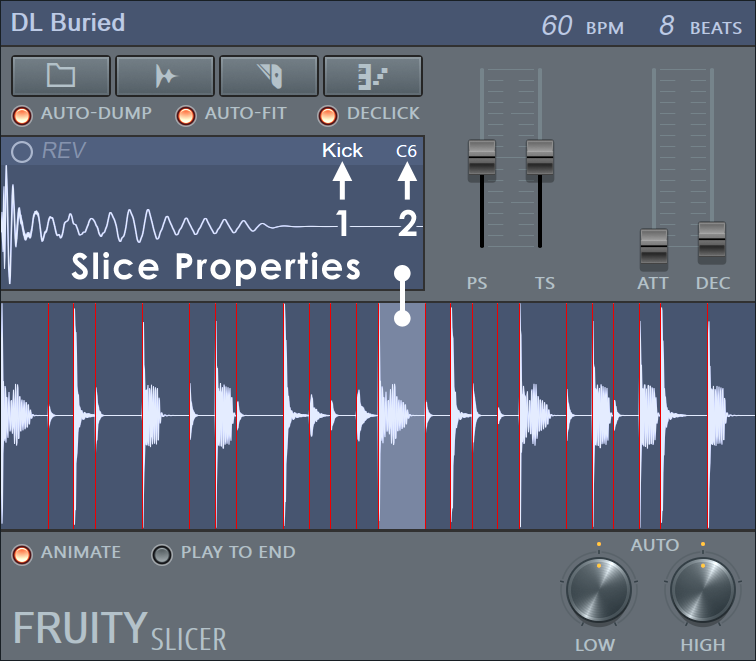 I suppose one could also slice up in ReSlice, then make a Slate kit with just midi notes (no samples) to play ReSlice. I’ve done that for Ruismaker and Ruismaker FM and it’s a nice way to play and record patterns for them. I make an AU instrument track, then add the Slate kit as a sub track with “Send midi to parent” activated to play it. Someone posted about issues with ReSlice in Ns2? Haven’t taken look at it yet. Could be the same issue as StepPolyArp, since ReSlice requires notes to be received to do anything. Matt identified the StepPolyArp issue already and it’ll be in the next release at some point I believe. Good call, @Blip Interactive might be helpful for you to consider these two apps’ ns2 issues as possibly linked, if you aren’t familiar with them and are going through bug reports might save you having to reach out to ReSlice dev. Oooh! ReSlice Rocks for this. I did it in standalone, sliced the sample as easily as in BM3, but was able to export directly to NS2 with two taps. No need for files app and AudioShare. Winner! Nope. Not the same issue at all. ReSlice plays just fine in NS2. However, I created a new preset in the standalone, and it didn’t show up in NS2, so maybe a different issue. I feel like your tagging Matt before I had a chance to fully document a suspected problem was premature. I would have preferred to do more research before bugging him. I’ll look into this preset thing some more. Tagged him on the offchance it was currently on his desk and the two were linked. Was trying to save the guy some work if it was something he was currently in the middle of dealing with.. I have all three Apps, but never sliced anything in them. You'll need to do a Refresh in order for NS2 to know that you have a new preset. Perhaps you already did this, but if not: On Auv3 Track, Manage > Refresh. Alternatively you can save your patches in NS2. I haven't tried this for ReSlice, but it should work. Alternatively you can save your patches in NS2. I haven't tried this for ReSlice, but it should work. I was fooling around with ReSlice today. I think there are a lot of ways it can be useful in NS. I can’t copy/paste samples from the NS2 library. It causes RS to hang on “Loading Editor “. Some functions in the standalone are missing in NS2. So far I’m thinking that preparing samples in the standalone and then using the AU as a player in NS2 is the way to go. Otherwise you can copy/paste from AS. But I don’t have much time in on it yet. Anyone else have any input? You can just zip and share direct from BM3 to NS2 as well, no need for files app and/or Audioshare. I managed to turn a typical breakbeat (bb4-1) into something interesting. Sliced it in ReSlice then used ReSlice AU as a player driven by Slate. More exploration to be done here. I’m inclined to choose ReSlice here as it’s so quick and easy to do and you get a kit to use in all of the other hosts (full disclosure: I rarely spend much time in BM3 but if that’s your jam, I get it). I think it’s worth importing to Slate pads still. One of several advantages would be velocity sensitivity (ReSlice bafflingly doesn’t respond to incoming velocity - an excellent app in spite of this). Maybe one day, down the road, we can lobby for an in-house slicer. Yeah - no velocity in ReSlice is a bummer. The problem I have with keeping kits in ReSlice is you can’t rearrange the slices or assign notes to them. It’s not very practical to have to rearrange midi tracks to play the kit sounds you need. So import to Slate or Obsidian is still needed in most cases for me.